Phil has served in the military, the intelligence community, and the inter-agency. He is also the found of Divergent Options. His written works are catalogued on Storify and archived at www.philwalter1058.com. I highly recommend them if you are at all interested in national security issues. You can follow him on Twitter @philwalter1058. I’m joined by Colonel Ian Langford, DSC (Two Bar), who has served the Australian Army and Special Operations Command, with distinction, for over two decades. He has served in the Solomon Islands, East Timor, Bougainville, Israel, Iraq, Lebanon, Syria, and Afghanistan where he was recognized with the Distinguished Service Cross for distinguished command and leadership in action as Officer Commanding Alpha Commando Company Group in the Special Operations Task Group, Operation SLIPPER. He is a Distinguished Graduate of the United States Marine Corps Command and Staff College and the School of Advanced Warfighting. He is currently a Visiting Fellow at Charles Sturt University. 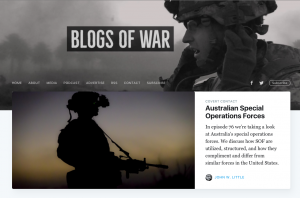 In episode 76 we’re taking a look at Australia’s special operations forces. We discuss how SOF are utilized, structured, and how they compliment and differ from similar forces in the United States. We also discuss the current state of the world, where it might be headed, and how that could impact the way special operations forces are utilized. This episode also opens up with what will likely become a reoccurring short segment with New York Times bestselling author and former State Department counterterrorism agent Fred Burton. Fred worked many massive counterterrorism cases throughout his career and I’ll be rolling out short reflections on those in several upcoming episodes. Wendy R. Anderson, Managing Director of Military and National Security Initiatives at Strong Eagle Media, joins me to discuss her company’s amazing new documentary Citizen Soldier and her previous work inside senior levels of the Department of Defense and other components of the federal government. We discuss service, sacrifice, and leadership from both civilian and military perspectives. Citizen Solider follows the Oklahoma Army National Guard’s 45th Infantry Brigade Combat Team from stateside training through combat, and loss, in Afghanistan. I highly recommend it. Putin called today’s downing of a Russian Su-24 by a Turkish F16 a “stab in the back” but it this was certainly not an unproved attack. In fact it follows countless warnings from Turkey that violations of its airspace (and aggression against its interests on its border) will not go unchecked. Terrorism analyst and counterintelligence pro William J. Tucker joins me again for a look at this event, the circumstances that got us here, and where we might be going. In episode eight I look at the case of Navy SEAL Rob O’Neill and the culture that lures men and women like him out of the shadows and into a world of fame, ego gratification, and financial reward. I examine the role that military leadership and our culture at large plays in chipping away at the notion of quiet professionalism and share some thoughts about how we can change course. There is also a call from Phillip Smyth, a researcher at the University of Maryland’s Laboratory for Computational Cultural Dynamics. Phillip shares some thoughts on social media and its impact on national security, politics, and the collection of intelligence. In episode 6 I look at the evolution of unmanned platforms and speculate about the impact that they could have on warfare. The technology is evolving faster than our appreciation for the complications it will bring so while there will be countless positive benefits there will also unquestionably be a dark side to it all. Smarter systems are better, and spare innocent lives, but does that mean that less ethical actors could exploit less capable platforms to kill indiscriminately? Does that give them an advantage? Blogs of War contributor William Tucker also called in to the Covert Contact voicemail line and shared some thoughts on how the U.S. intelligence community should be allocating its resources.